... and head out on the water canoeing or kayaking. With the scorching hot temperatures we have been having lately, I thought I would share at least one great way to cool off; by paddling around the lake. 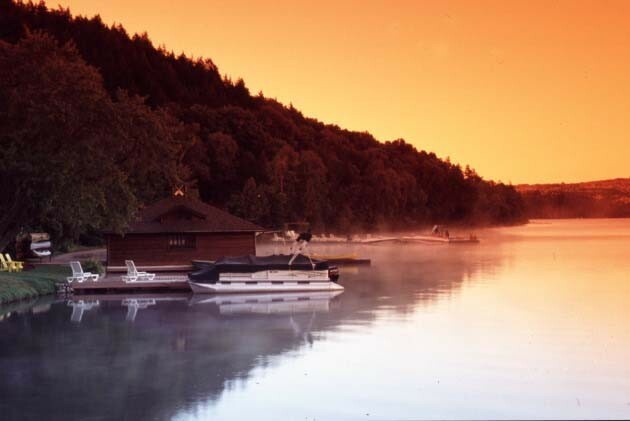 Ontario is home to over 250,000 freshwater lakes and the majority of our resort partners are situated on some of these bodies of water. This gives new and returning guests the perfect opportunity to try your hand at manoeuvering either of these types of watercraft. Before you head out on the water there are a few things you should consider. First is always wear a life jacket. Even the most advanced swimmers, canoers and kayakers will tell you this is a must. Paddling can be unpredictable at times so safety and respect for the water need to be on the front of mind. Make sure the paddle you are using is the correct size for your body. Using a paddle that is too long or short, will make paddling more of an exercise than it needs to be. This is especially important if you plan on going for a long distance. Muscle fatigue can occur quickly and you don't want to be too far from your original destination that you can't make the return trip. It's also worth noting that unless you paddle every day, you'll be using muscles you don't normally use. Notify someone of your planned route. This way if you don't return within a reasonable time, there is someone on shore that knows to go looking for you. If you aren't sure how to use a kayak or canoe, ask for help. Any fellow paddler I have ever met has always been friendly and open to sharing tips and even experiences. They can tell you areas that are safe and spots to avoid. Wear sunscreen. While the water may seem cooler, it also reflects the UV rays making it easy to develop a painful sunburn while on the water. These are just some of the guidelines to keep and mind and it is always important to ask questions. Afterall when you are staying at a resort the owners and staff want to make sure you make the most of your experience. For more information check out our partners Algonquin Outfitters and The Portage Store for tips and information. The first paddling experience I can remember was with my mom. She took me paddling around an island in an older style, (slightly leaky,) canoe. It was on Otter Lake outside of Parry Sound. As we paddled around close to shore, my mom pointed out a big snapping turtle in just a foot of water. It might have looked bigger because I was so young but I would swear it was as large 2 - 3 feet around (Or as my mom put it, as big as our deck table.) The trip was ended with my mom splashing me and of course me returning the favour. (Paddles are great for throwing some water around.) While it is a nice way to cool off during the heat of the day, heading out in the morning or evening offers different rewards. Many lakes from Central Ontario to the far north experience morning fog or mist which burns off when the sun comes out. Paddling through the mist presents possibly the most relaxing feeling in the world. If you are out early enough, you'll feel as if time stands still. Provided there is no wind (which I find for whatever reason is more often the case ,) the waters are so calm it's like paddling across glass. It is usually silent exception for the sounds of nature, there are rarely any boaters out except for maybe a few fishermen and the loons are active. When out on early morning paddles, I have been welcomed by the haunting call of a loon after it popped up right beside my canoe. Paddling in the evening is again a great experience, in part because once again the fishermen and canoers reclaim the lake from the heavier boat traffic. Paddling as the sun starts to set is an amazing experience. 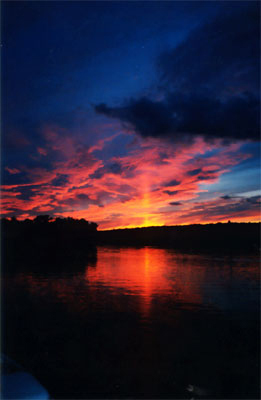 If you time your trip right, you'll be able to capture the reflection of the different hues stretching across the sky. Just be careful not to be out too late as it can be hard to see your way back when the sun goes down. Over the years, I have been fortunate enough to paddle many different lakes in Ontario. 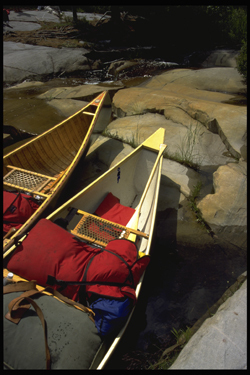 Being in a canoe or kayak gives you access to areas of lakes and rivers that boaters can't get to. You can also move in closer to shore without much worry about bottoming out your boat. It's a great way to get stunning photography of natural landscapes, cool off, relax or burn calories. To view some resorts with great canoeing or kayaking click here.